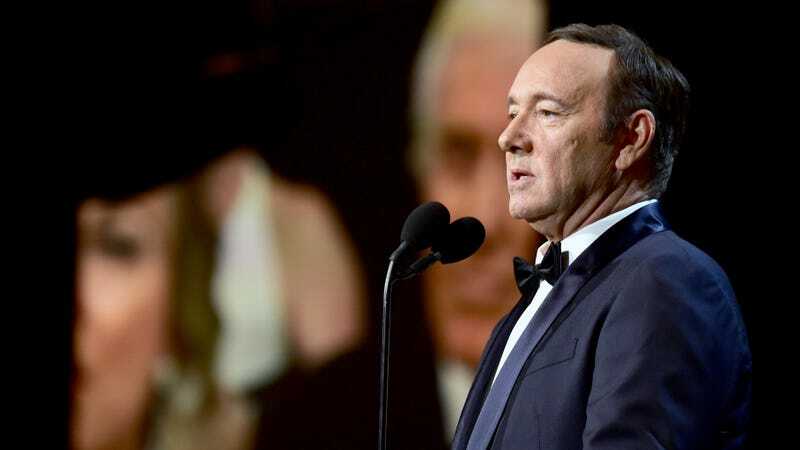 Netflix formally cut ties with Kevin Spacey tonight over mounting allegations of sexual harassment, assault and other inappropriate behavior that have been levied against him over the last week. Variety reports that Spacey has been officially fired from the cast of the streaming service’s political drama House Of Cards, and has had his planned Gore Vidal biopic, Gore, canceled by the company, despite the fact that it was already in post-production. Netflix will not be involved with any further production of House Of Cards that includes Kevin Spacey. We will continue to work with [House Of Cards production company] MRC during this hiatus time to evaluate our path forward as it relates to the show. We have also decided we will not be moving forward with the release of the film Gore, which was in post-production, starring and produced by Kevin Spacey. Earlier today, the producers of House Of Cards speculated on how the show might go forward in the wake of the allegations against its star; theories ranged from a possible spin-off, sans Frank Underwood, to simply killing Spacey’s character off.